1 TEXAS OWNER -- LEATHER & HEATED FRONT/REAR SEATS -- TOW PACKAGE -- CLEAN CARFAX! 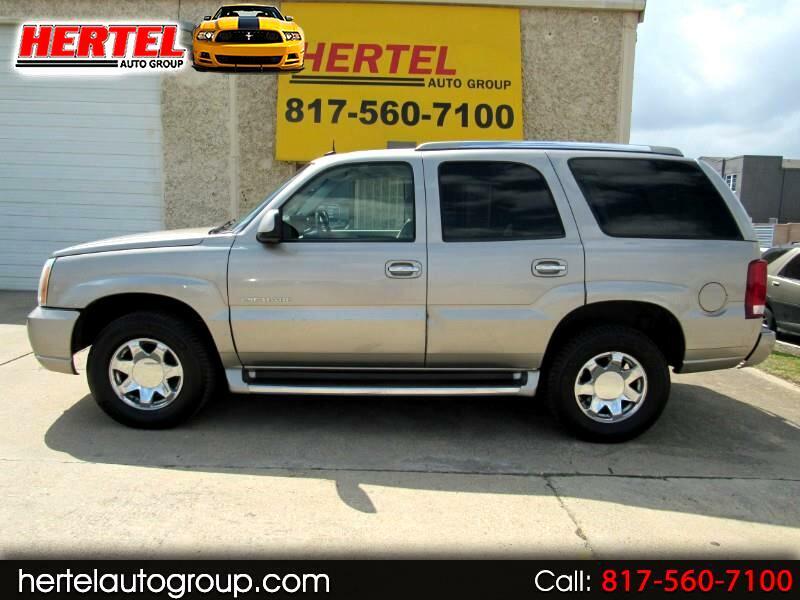 Hertel Auto Group is pleased to offer this beautiful, luxurious and capable 2003 Cadillac Escalade 6.0L V8 AWD Full-Sized SUV for Sale in Fort Worth Texas. Bought brand new from Sewell Cadillac Dallas Texas in October of 2003, this upscale Caddy Sport Ute has spent its entire life right here in the North Texas area. If you've been looking for a room, capable and proud-to-show-off SUV for a growing family; one to use as a foundation for customizing it to your liking; or just something enjoyable to ride and drive in on long road trips, this would be a great choice. Having All-Wheel-Drive and a more powerful engine ("Base" Escalades have the smaller 5.3L V8 Engine) are additional pluses to appreciate in this one. And with an original MSRP of $55,010, it also represents a great value - especially given that was only driven around 7,600 miles a year. Despite being a huge hit as it was in 2002, the 2003 model added an improved StabiliTrak stability control system; an Improved Braking System; Dual-Stage Airbags; Adjustable Pedals; a Front-Passenger Seat Sensor and more. The interior was also improved with new features like Tri-Zone Climate Control, Satellite Steering Wheel Controls and a Redesigned Instrument Cluster & Center Console. Equipped with the legendary GM 6.0-Liter OHV 16V VORTEC 8-cylinder engine, it had original factory specifications of 345 horsepower and 380 lb ft of torque while still returning a fair EPA mileage rating. When properly equipped, it can tow up to 7,800 pounds. Mechanically, it starts, runs, drives and performs exactly like you'd expect it to. All four 265/70R17 tires mounted on OEM 17" Chrome Wheels are in good to very good condition. On the outside, this Caddy's rust-free body is finished in an rich-looking Silver Sand (It looks Pewter to some and Champagne to Others) Paint Scheme that is complimented by a Tan Leather interior. Inside, its smoke-free interior is nicely equipped with Leather; Heated Front & Rear Bucket Seats; Power Driver's Seat; Rear A/C Controls; Power Windows, Locks & Mirrors; Cruise Control; Premium Bose Audio; Bulgari-Inspired Analog Clock; Power Adjustable Foot Pedals; Electronic Climate Control; Cold A/C; Keyless Entry; and more. Of note is the Front Driver Seat that has Power Controls that are "backwards" in that when you move it forward it goes backward and vice versa; and the Glove Box which is not operational. As with any pre-owned vehicle, it does have the usual amount of cosmetic imperfections that are inherent to a vehicle of this age and mileage. We invite you to view all of the photos that are available on our Web Site and determine for yourself if it meets your expectations for a vehicle of this age and price. If it does, we then welcome you to stop by for a viewing and test-drive of this clean 2003 Cadillac Esclade 4x4 All-Wheel-Drive SUV. Given its ownership history, condition, amenities and mileage, we've priced it fairly in the marketplace and expect it to sell quickly. Don't let it pass you by!